The Little Dutch Boy Who Saved Holland Worksheet – Download our interesting FREE Word Searches. The FREE worksheet about the Little Dutch Boy Who Saved Holland includes a fun search a word puzzle as well as a fun hidden words puzzle game for kids. This fun yet educational printable science worksheet all about the Little Dutch Boy Who Saved Holland is freely available for you to download and use at no cost and you are permitted to use our Little Dutch Boy Who Saved Holland worksheet as many times as you need at home or in school! The FREE word search on the Little Dutch Boy Who Saved Holland is a fun and an easy way to encourage the natural interest of kids during a science enrichment class, homeschooling, distant learning lessons, regular school science classes or while taking part in early learning activities. 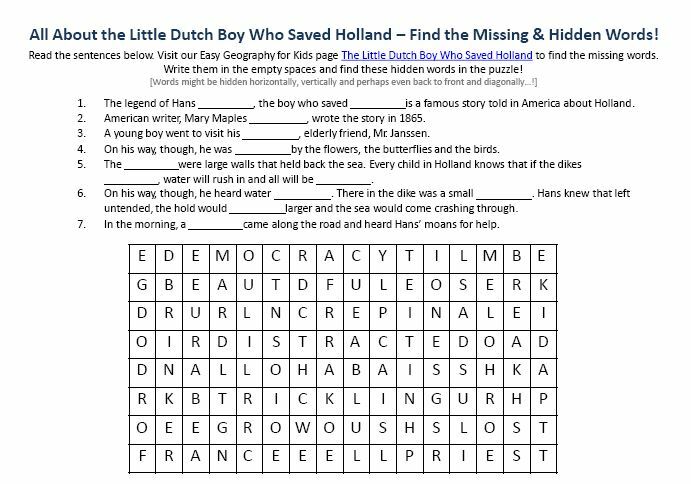 Our FREE Little Dutch Boy Who Saved Holland word searches for kids is ideal for Grade school kids from 1st Grade to 5th Grade. Additionally, Kindergarten kids or even kids in Preschool will also enjoy this Little Dutch Boy Who Saved Holland word search worksheet. Your kid can have fun learning fun facts all about the Little Dutch Boy Who Saved Holland with this worksheet while playing the word search puzzle. Your children will enjoy to learn fun facts all about the Little Dutch Boy Who Saved Holland while playing the FREE word searches activity. Elementary school kids from Grade 1 to 5 can enjoy our Little Dutch Boy Who Saved Holland worksheet as a reading comprehension worksheet. Kids will learn well as kids will probably have to read several times the facts about the Little Dutch Boy Who Saved Holland to properly find the missing words. This printable word search is not only a great way to increase kids science knowledge, but also increases the memory and also grows their reading skills. Preschool kids and Kindergarten kids who haven’t yet learned to read can use this free fun facts Little Dutch Boy Who Saved Holland worksheet as an exciting listening comprehension game. Parents and Educators can read the fun facts about the Little Dutch Boy Who Saved Holland. Next, they can help the kids to recall what were the missing words. And then, kids learn to recognize words and find them in the Little Dutch Boy Who Saved Holland word search game. Parents doing homeschooling activities with their kids can use this Little Dutch Boy Who Saved Holland worksheet to awaken their kids in interest in science. Teachers and private tutors can use our FREE Little Dutch Boy Who Saved Holland worksheet to add to the regular science classes at school and interest children in learning all about the Little Dutch Boy Who Saved Holland. Most beneficial is to use our free science worksheet for children on the Little Dutch Boy Who Saved Holland alongside the free interactive online quiz with score on the Little Dutch Boy Who Saved Holland. Our Top Science Kids website offers many FREE printable fun earth science worksheets for kids and FREE printable word searches. Download and use our fun science word puzzles to make learning science fun for your children! What do you know about the Little Dutch Boy Who Saved Holland? How did the little boy save Holland? Who wrote the Legend of Hans Brinker? Is this story an authentic Danish legend? What other names does the Little Dutch Boy Who Saved Holland story go by? Learn more fun facts about the Little Dutch Boy Who Saved Holland by downloading our free fun Little Dutch Boy Who Saved Holland worksheet for children! [sociallocker]Get the FREE word puzzle about the Little Dutch Boy Who Saved Holland. Download our FREE Little Dutch Boy Who Saved Holland Worksheet for Kids! Did you enjoy the FREE Little Dutch Boy Who Saved Holland Worksheet? Read lengthy information about the Little Dutch Boy Who Saved Holland here. Declan, Tobin. " Little Dutch Boy Who Saved Holland Worksheet - FREE Word Searches ." Easy Science for Kids, Apr 2019. Web. 23 Apr 2019. < https://easyscienceforkids.com/little-dutch-boy-who-saved-holland-worksheet-free-word-searches/ >.